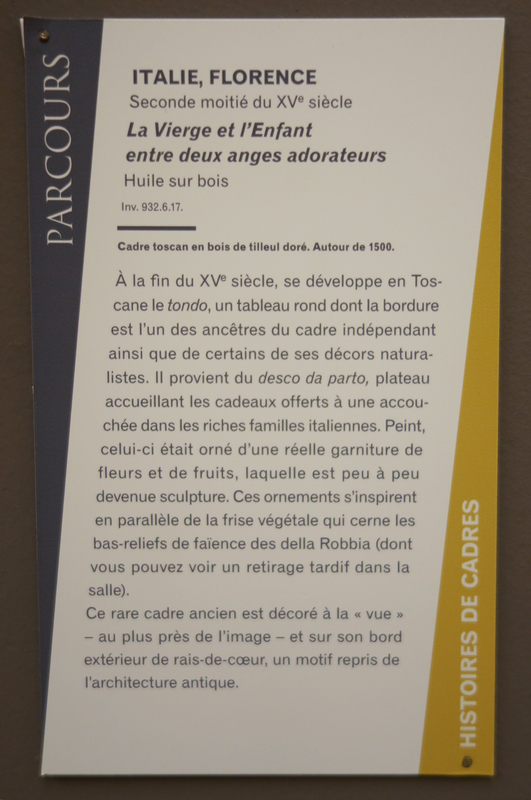 The focus on frames in the Musée des Beaux-Arts de Rouen – Histoires de cadres – aims to give a comprehensive view of the history of picture frames, based on the Museum’s own collection. It is designed in two phases. First, one room shows empty frames in a chronological display, inviting the public to consider the frame as an object in itself. 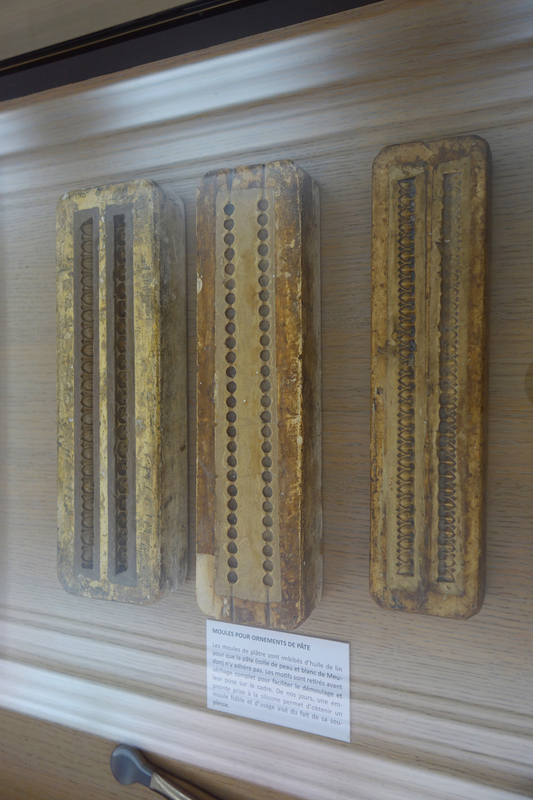 This room is also dedicated to traditional framemaking techniques: a video explains the work of the Museum’s frame conservation studio, with tools and moulds exhibited in a vitrine. Secondly, a thematic trail through the permanent collection highlights the most notable picture frames, with wall captions placing them in the context of the country and decorative arts period they belong to, while also giving the visitor an appreciation of the aesthetic qualities of each frame. 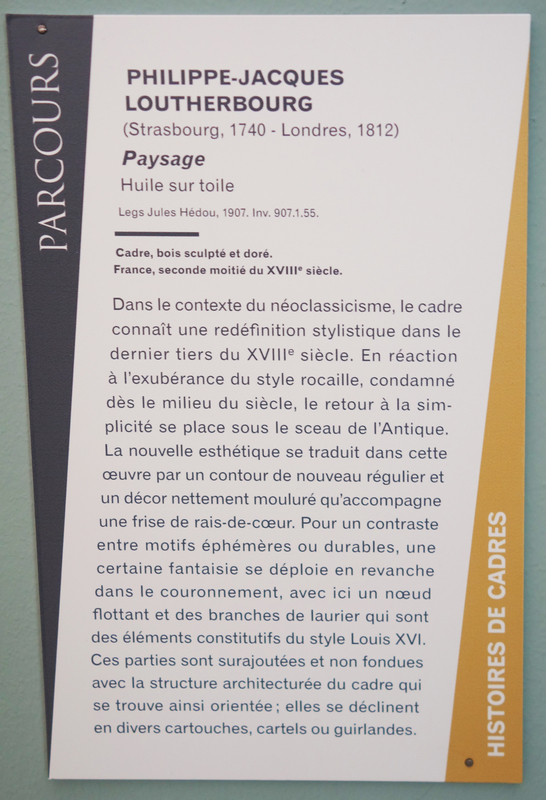 The captions also mention the techniques involved in their manufacture, and address the issue of originality – whether the frame is original to the period of the painting, or to the painting itself. 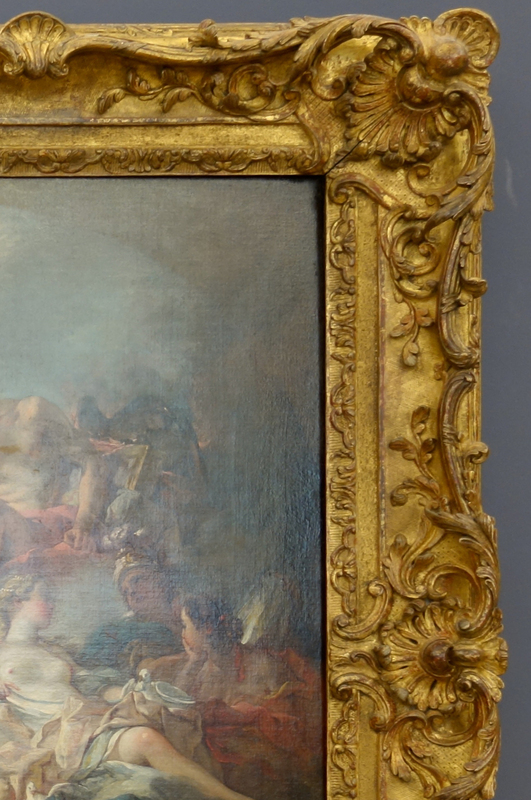 Exceptional frames are highlighted, but pieces such as a 19th century compo frame are also brought to light, as representative of an important moment in the history of frames, when mass-production started. 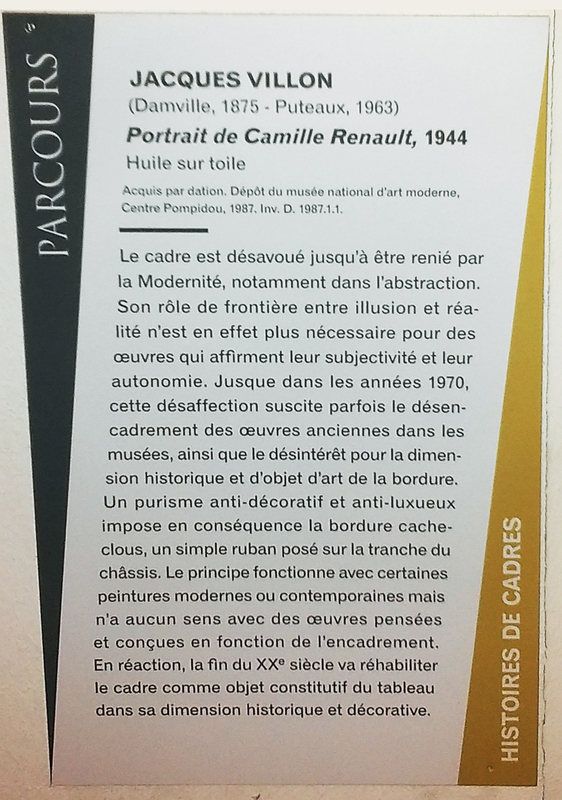 The trail starts with a 15th century frame integral to its painted support, and ends up with a simple black ribbon pinned around a 1944 portrait by Jacques Villon – the brother of Marcel Duchamp – bearing witness to the Modernist period in which frames were rejected. 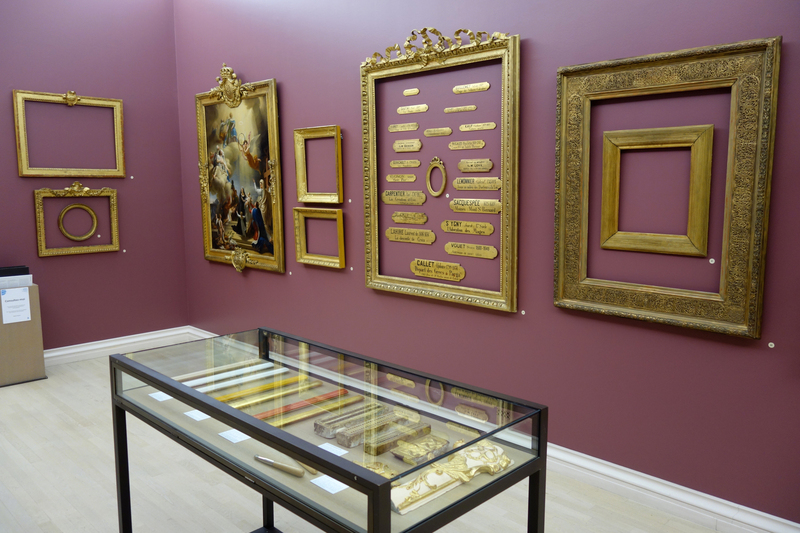 Diederik Bakhuys, curator at the Musée des Beaux-Arts de Rouen, explains that the idea for the ‘exhibition’ originated in the fact that they keep beautiful frames in store, and that the Museum is one of the few in France to have a frame restoration studio. The project was conceived with Iman Moizadeh, and developed with Olivier Clément and the Educational Department of the Museum, and aims to attract the visitors’ attention to that often unnoticed auxiliary to the painting. 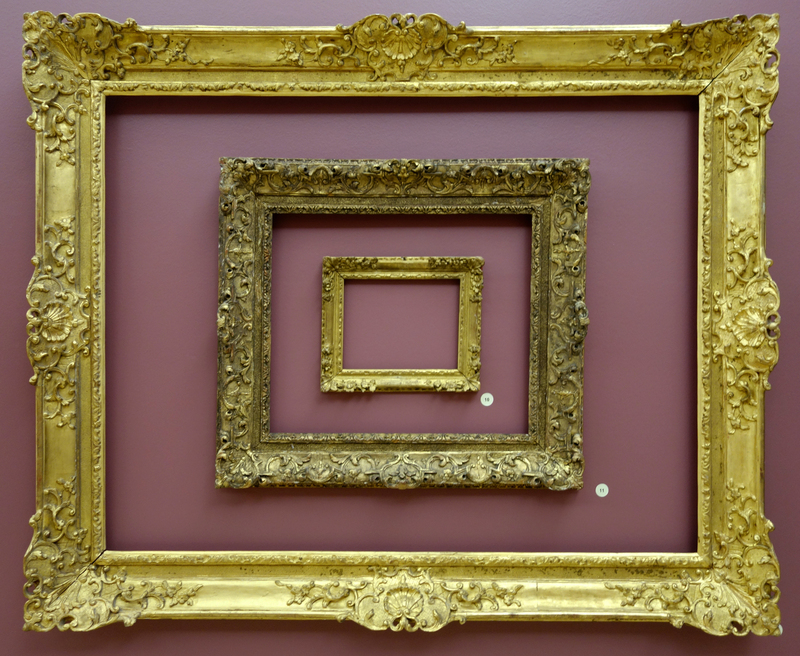 Louise Delbarre: How did the public react to this focus on the frames in the collection? Diederik Bakhuys: It is difficult to get feedback; people wrote mostly general comments in the visitor’s guide. But when I walk through the rooms I can see the public reading the wall captions and being interested in the presentation. Many of my colleagues have also shown their interest in seeing this specific issue addressed, as it is quite unusual. LD: Did this experience make you want to go further and curate a whole exhibition dedicated to picture frames? DB: We have nothing planned for the time being. We made created this project with the available frames in the museum; for a full exhibition we would need the support of more complete collections. 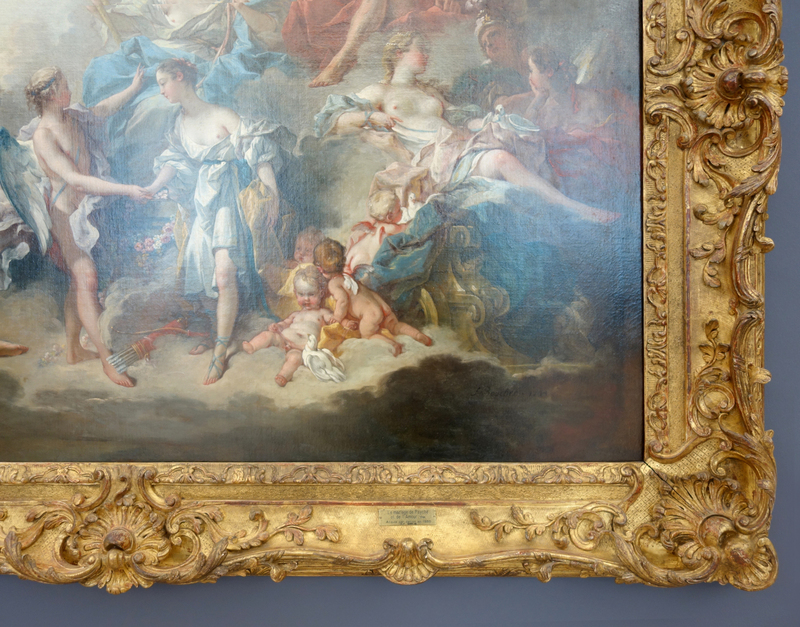 We have many beautiful frames, but we do lack some representative frame types and examples of chronological periods – for instance, we do not have some of the less common designs, such as Auricular frames; and although we have some beautiful 18th century frames, if you go to Versailles or to any of the national museums you will see really exceptional frames from the royal collections. We would need examples of every kind of frame in order to mount a wider exhibition. Such a display would encourage an appraisal of French frames, and of frames in the French collections, but it raises a lot of questions. 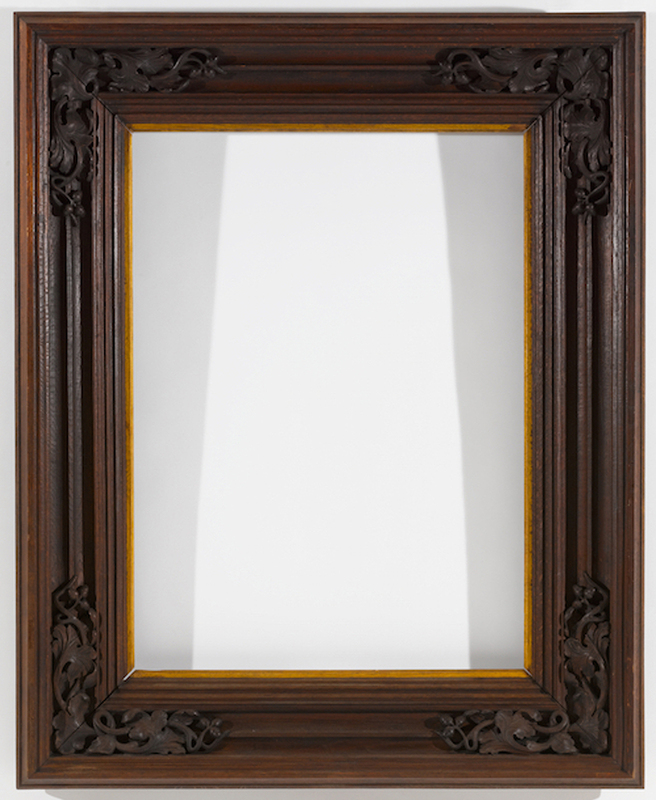 Should one show the frames on paintings, or concentrate the visitor’s attention only on the empty frames? It would be very challenging, but it seems obvious we are behind the times in that field in France, and that frames are something very important. We also have to provide an education for the public. Outside art historical circles the issues raised by frames are not always well understood. I sometimes hear people saying, ‘It would look better without a frame’! 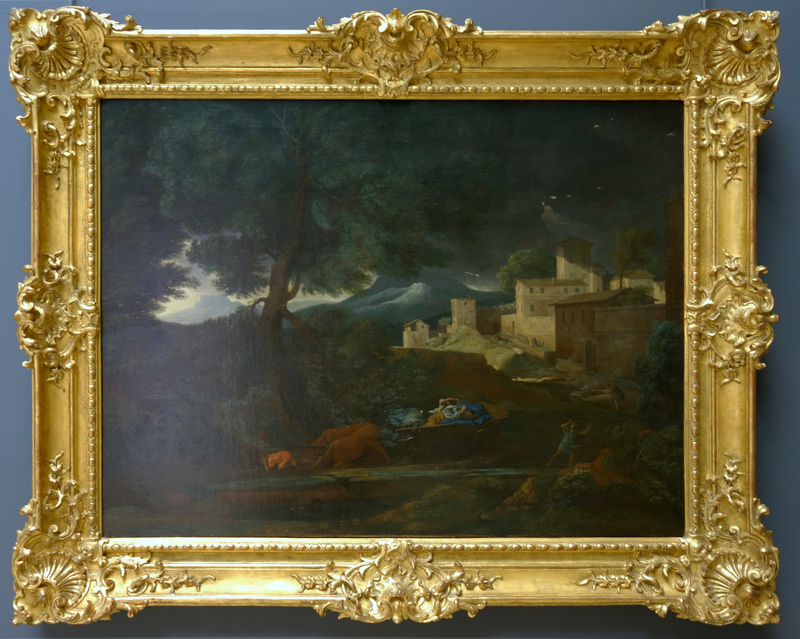 We need to educate the public, firstly to remind people of the historical significance of frames – that it is very difficult to understand a painting without that contextual element; and secondly, of course, to emphasize the great beauty, technical originality, and in fact all the great qualities of antique frames. 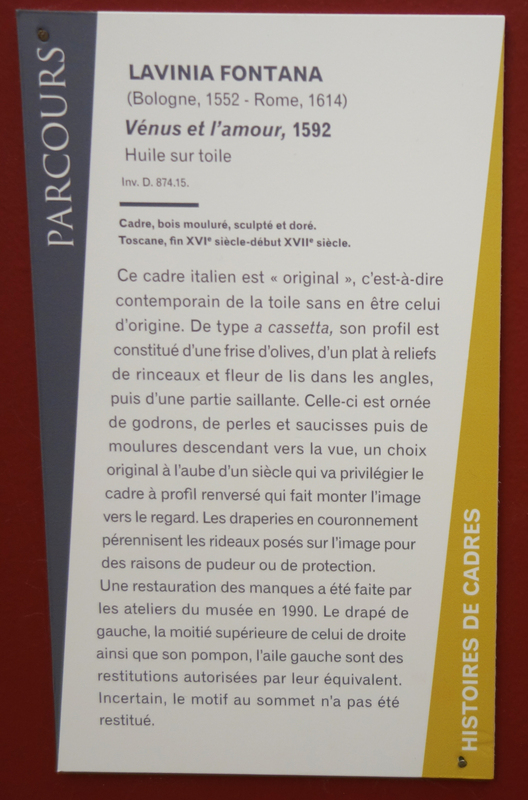 LD: Does the Rouen Museum keep a lot of empty frames? DB: Well, the Museum does keep a lot of large-format frames. When academic art fell out of fashion, large paintings were rolled up for storage, and their frames were dismantled and kept separately. Some of them disappeared over time, and the ones we still have are difficult to reuse because their wood has warped. It is difficult to go back in time because we lack archives, but it seems a lot of frames were removed from the paintings in the 1950s. 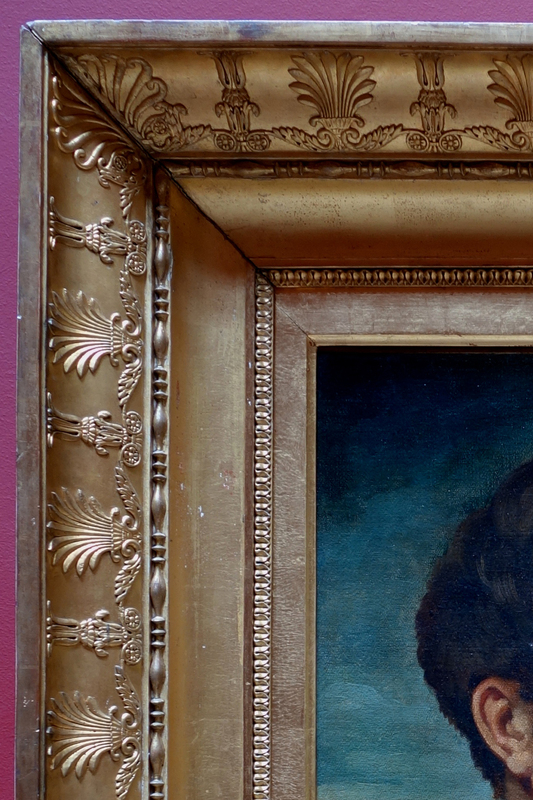 Many of them were considered worthless, and were taken off the paintings and stored in poor conditions; we have lost some of them, unfortunately – mostly 19th century frames, as 18th century frames received a lot more attention. 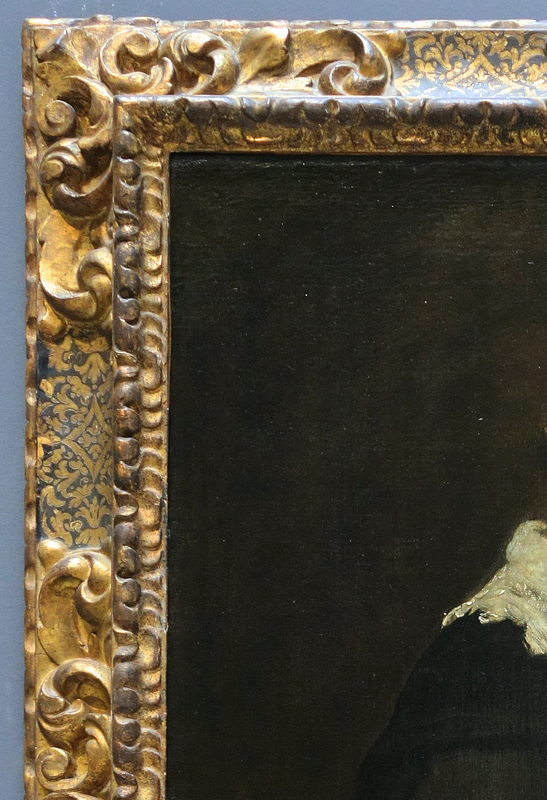 Thanks to our frame restoration studio, we’re continually conducting research to find original frames, and to reunite them with the paintings whenever possible. LD: Does the Museum acquire frames now? DB: Only exceptionally. The most remarkable is the 17th century Spanish carved frame around Vélasquez’s Democritus. 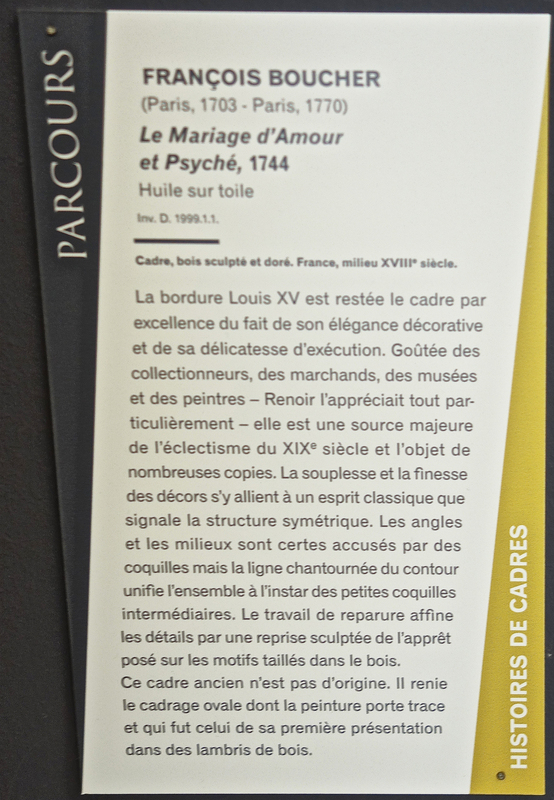 It was purchased in 1990 through the auction house, Groupe Gersaint. 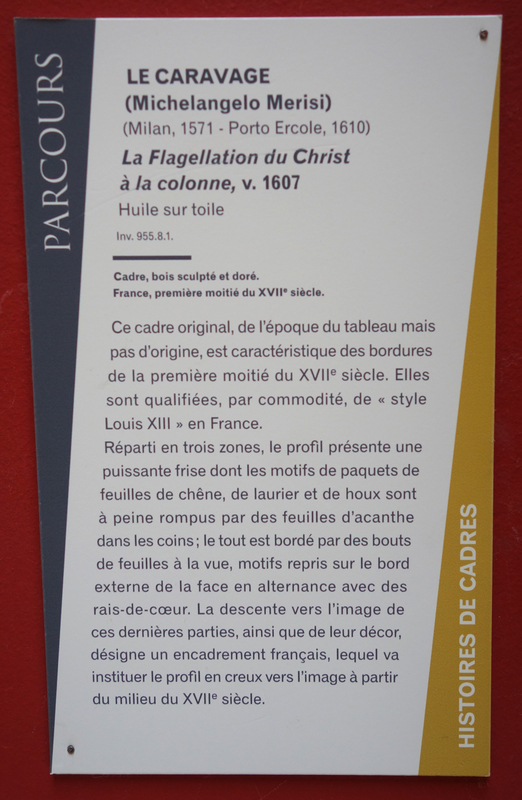 Other museums do this much more often: the Palais des Beaux-Arts of Lille, for instance, carried out some important frame acquisitions when it was renovated, thanks to its patrons. LD: Do you have any archival material on your frames? DB: Unfortunately we don’t have any invoices, nor anything from the collectors who gave their works to the Museum. One of our recent major patrons is Henri Baderou, who gave us a considerable collection in 1975. He liked to present his works without frames: the paintings arrived at the museum this way and we had to find frames for them. We must have used pieces from the museum’s store, because I never found any records of purchases. When the museum was renovated in 1992-4, my predecessor dealt with the question of frames. He researched the museum’s old photographs in order to try to identify the frames when their identifying tablets had been removed. As the frames were dismantled and the tablets taken off, there is still a lot of investigating to be done. 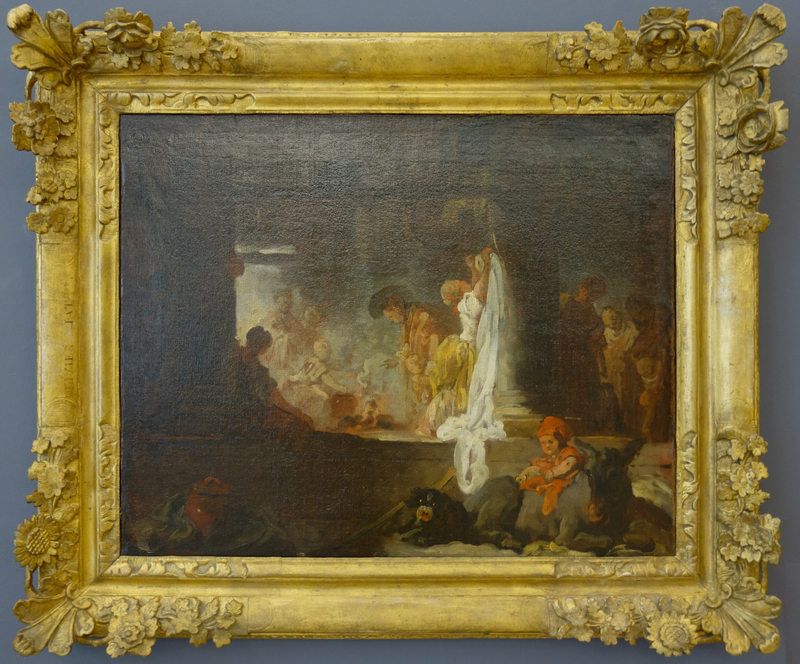 Pierre-Henri Révoil (1776-1842), Jeanne d’Arc prisonnière à Rouen, 1819, o/c; French compo or plaster gilt Directoire frame, with fleurs-de-lys & lily buds, & small enrichments of beading, bay leaves & rais-de-coeur; early 19th century. 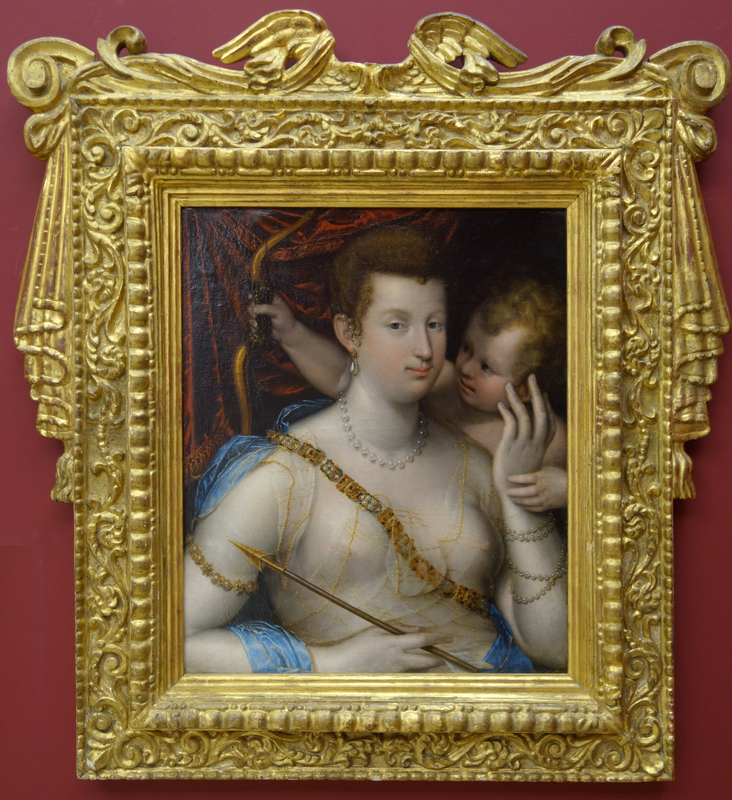 The frame above is original to the painting and was chosen by its first owner, the Duchesse de Berry, niece of Louis XVIII and step-daughter of Charles X. The palmettes and lotus typical of the Empire style have been replaced with fleur-de-lys and ermine tails, the symbols of the French monarchy. LD: Do you think that frames are works of art? For Gerry Alabone, it is not necessarily a relevant question for museums, as ‘one needs to consider if the frame supports the story of the painting, and how changing the frame also changes the story’ there. 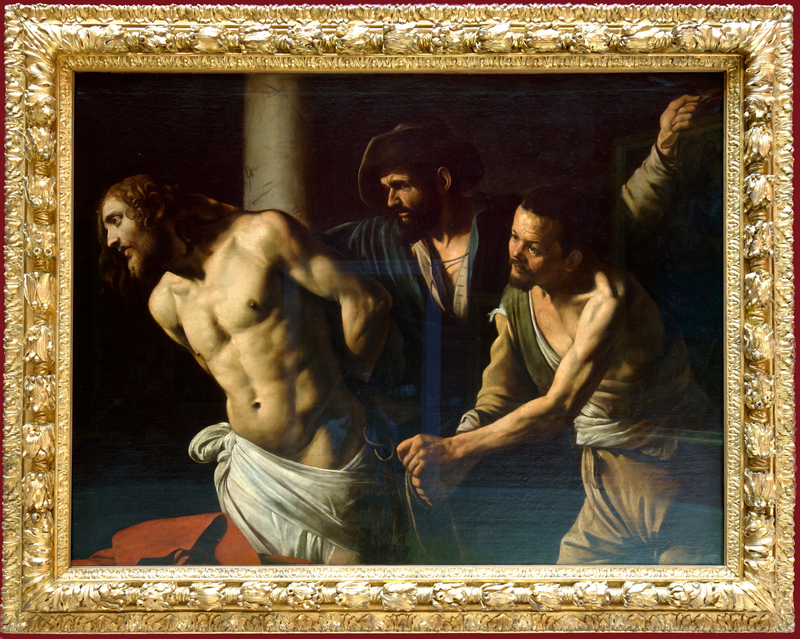 DB: Yes, I think one should always consider frames in their relation to paintings. To some degree, we must take a step back from the theoretical debate about what makes a work of art and from that relation between major and minor art. I greatly admire the British approach to artworks, considering every element of their context. The frame is really something crucial. It is crucial today, and it was even more essential in the past, because one has to imagine the collections in very different settings from that of the museum. 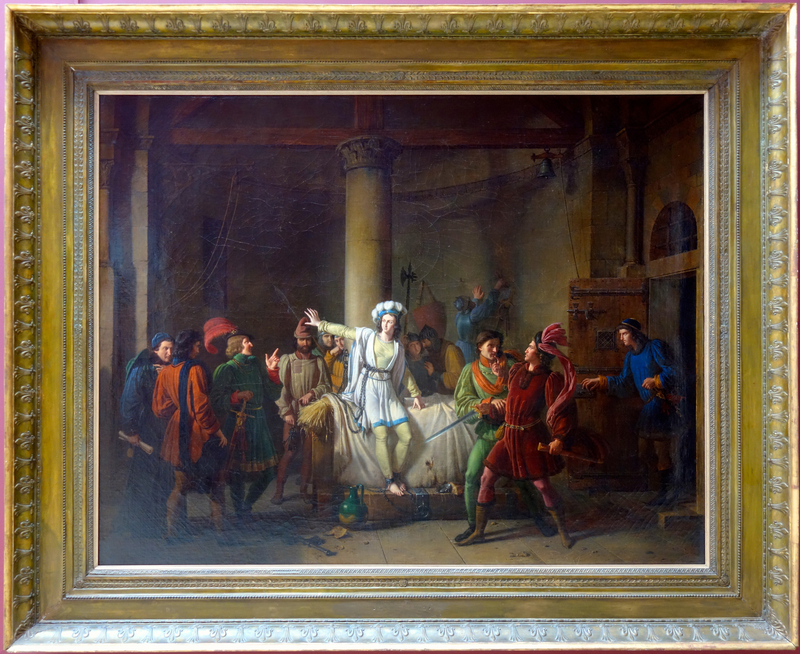 There were times when frames were all the more important because the work of art was part of an interior which might be visually very busy, with hangings and ensembles of furniture – much busier than the rooms in museums today. 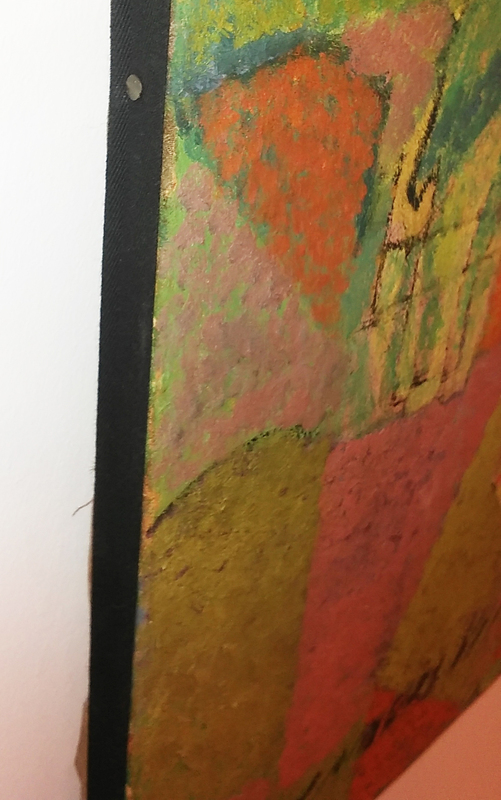 We can render the historical hierarchy in which the essential element is the painting, and we can consider frames as objects used to cast a favorable light on the pictures, but we must also have the utmost respect for the plastic qualities and the historical meaning of frames. This being said, I am generally not very doctrinal: I think it is difficult to have a preconceived theory on that matter, as one can also make errors. Some collectors may have made unfortunate choices, and this raises the question – should one should respect the history and origin of the work, for instance: the taste of its first collector? In most cases, I would tend to say the answer is yes, but I think we must be flexible. We have to have the utmost respect for frames, but to remember at the same time that what we come to see – what visitors come to see – at the Museum are the paintings; and we must also keep in mind that the mission of a major art museum today is not only to display the works, but also to provide a better understanding of how they were perceived in the past. 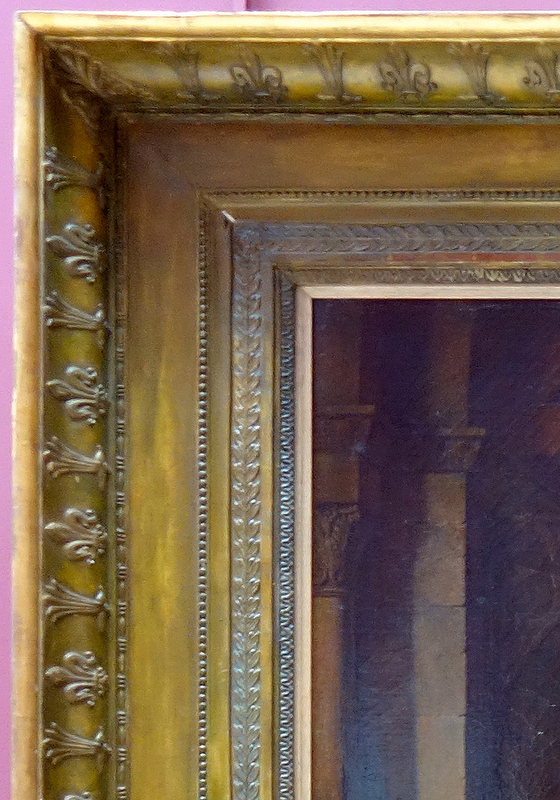 LD: This heavy waxed oak frame (top) was found in store at the Musée des Beaux-Arts de Rouen. 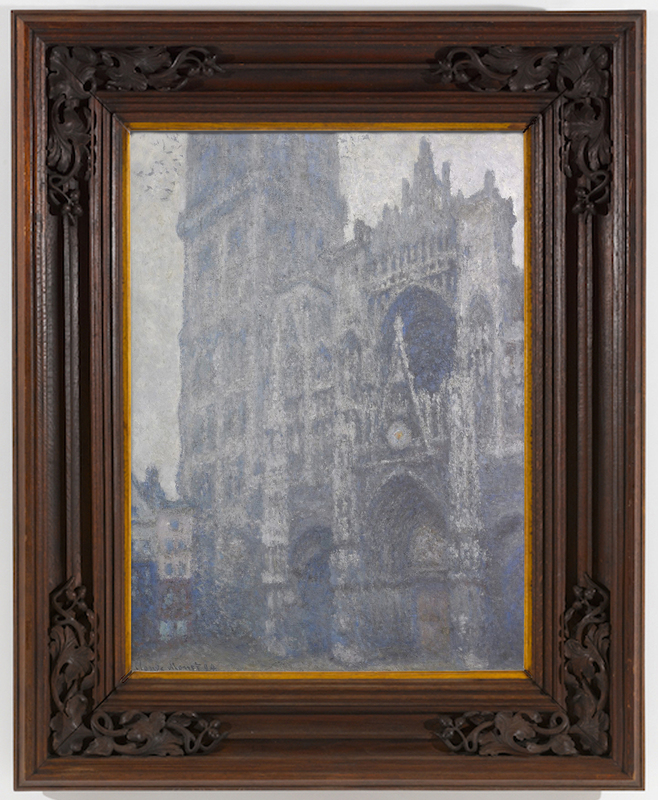 A chalk inscription on the reverse revealed it previously contained Le portail de la cathédrale de Rouen, temps gris by Claude Monet, one of the icons of the museum. 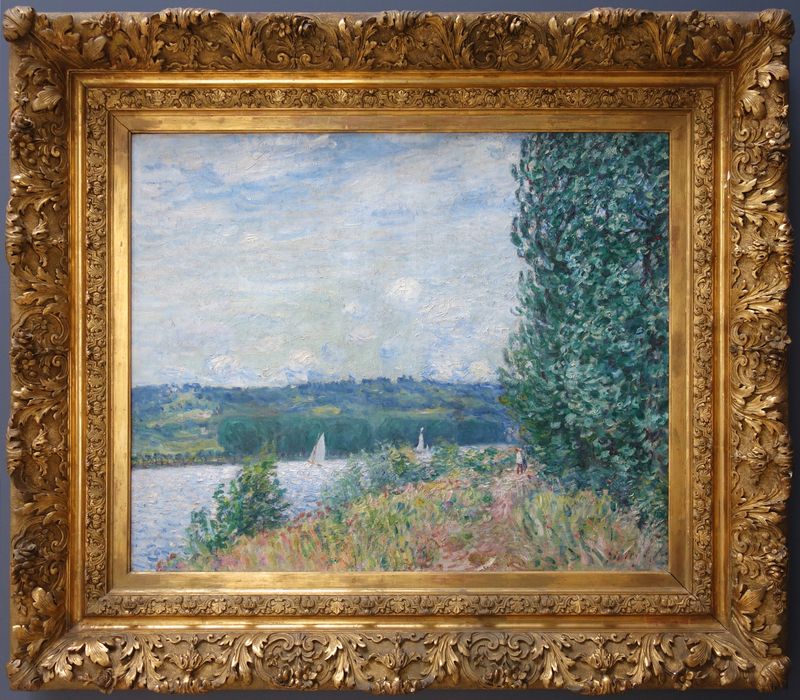 The painting was given by the collector François Depeaux (1853-1920), and it is thought that he chose this frame to suit the interior of his villa at Mont-Rivoulet, where his Impressionist paintings were displayed on antique wood panelling. 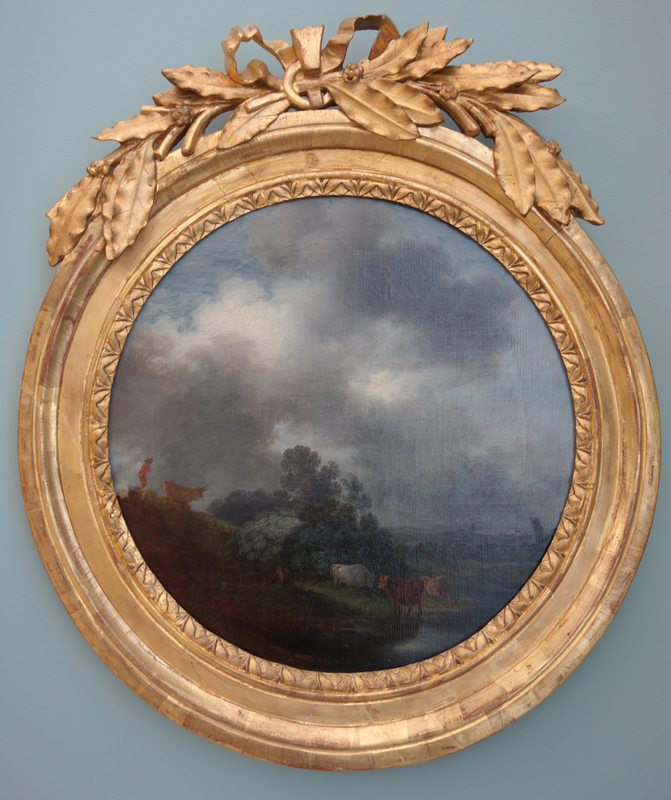 The Museum chose to exhibit this empty frame alongside the painting in its regular frame, to highlight how taste changes over the centuries. 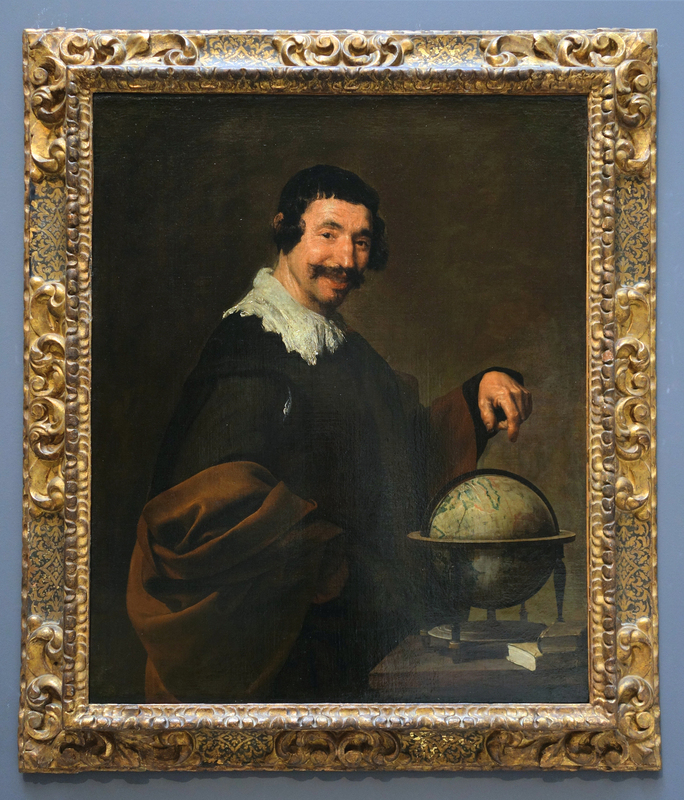 According to Diederik Bakhuys, this case illustrates the limits of an approach systematically based on historical criteria, as it would have been unthinkable to show one of the Museum’s masterpieces in what is seen today as a dark, ‘bourgeois’ frame. With thanks to Diederik Bakhuys for his time, and to Yoann Groslambert of the Musée des Beaux-Arts de Rouen for his help with the image of the ‘Depaux frame’ used in this article. 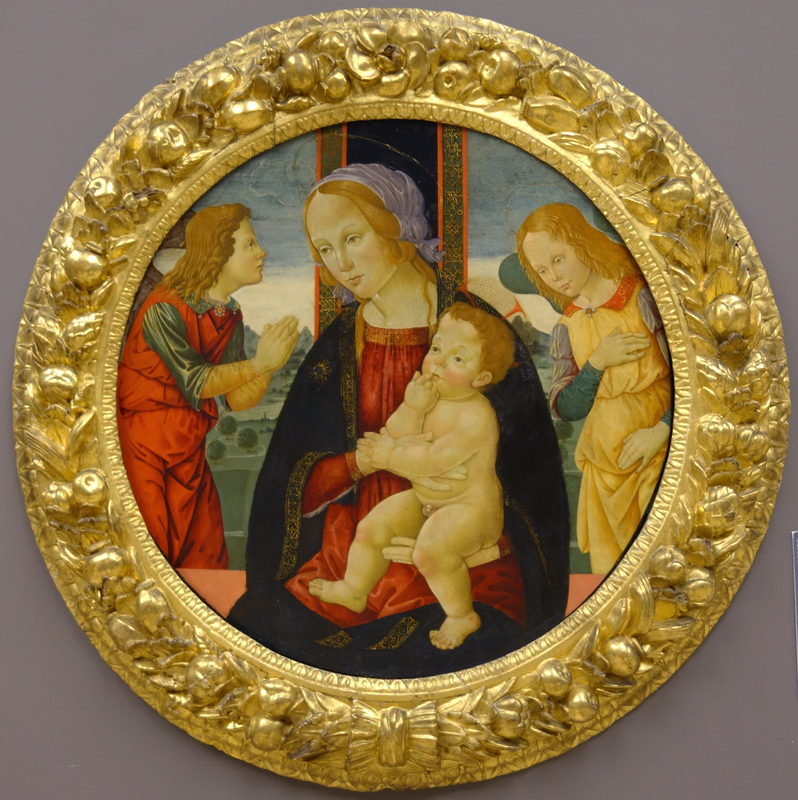 ‘The tondo evolved in Tuscany towards the end of the 15th century – a circular painting, in a setting which is one of the ancestors of the movable frame decorated with naturalistic motifs. It derives from the desco da parto, a wooden tray used to present gifts of food to a new mother in wealthy Italian families. This was painted, and covered with real flowers and fruit which gradually, over time, were replaced by carved versions. These motifs simultaneously inspired the garlands of fruit and flowers which surround della Robbia ceramic reliefs (a late example of one of these is also displayed in the Museum). This rare antique frame is decorated at the sight and back edges with rais-de-coeur, an ornament found in classical architecture’. ‘This Italian frame is ‘original’ in the sense that it is contemporary with the painting without being its first frame. It is a version of a cassetta*, with a beaded back edge, a frieze of undulating foliate sprays, with fleurs-de-lys in the corners; a projecting knulled moulding; astragals and beads, and stepped mouldings to the sight edge. This type of profile is characteristic at the dawn of a century which preferred the form of a reverse frame, which pushed the image forward, towards the spectator. The carved draperies at the crest imitate the curtains which were sometimes used to cover an image, either for modesty, or to protect it. 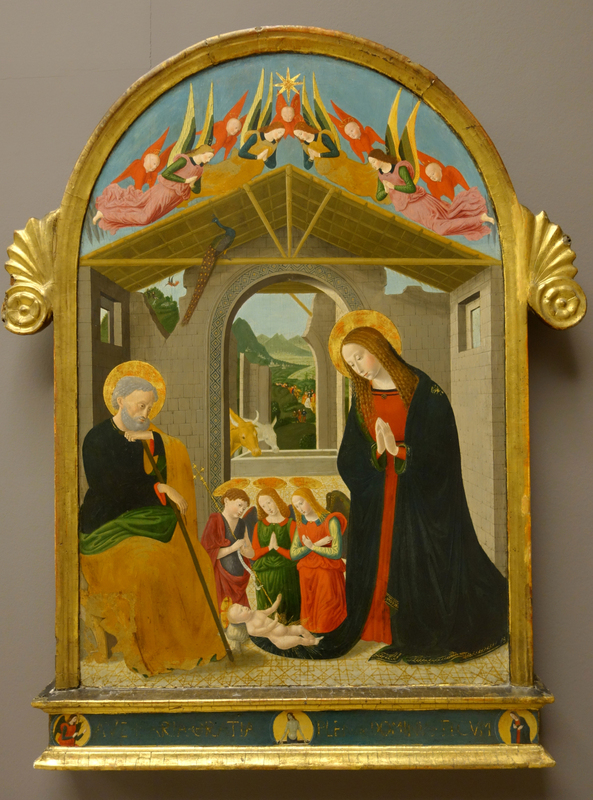 In 1990, losses to the frame were restored in the Museum’s workshops. The hanging drape on the left, the top part of the one on the right, together with its scroll, and the wing on the left have all been copied from the equivalent surviving parts. However, there was no guide for the missing central motif at the top, so this has been omitted’. * Probably describable as Mannerist in style. 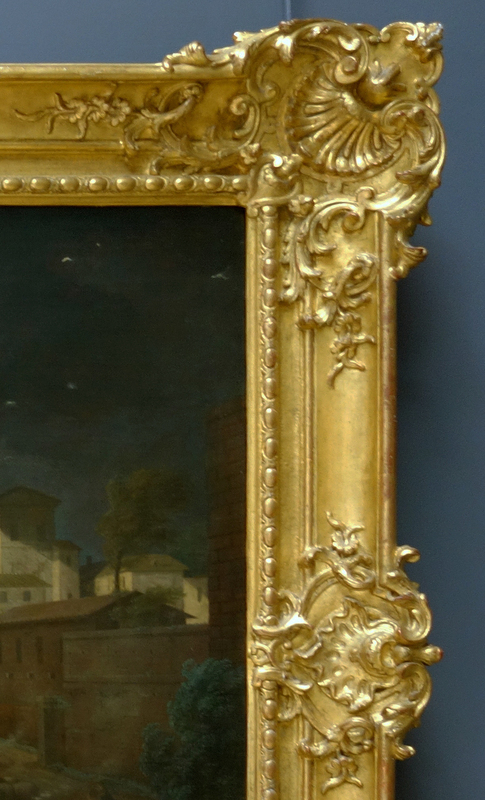 ‘This original frame (contemporary with the painting but not original to it), is characteristic of designs from the first half of the 17th century, which are known as style Louis XIII in France. The profile has three orders of ornament, including the sculptural central frieze, with a garland of bunched leaves – oak and bay* – gently interrupted by acanthus leaves in the corners. This garland is bordered by acanthus leaf tips at the sight edge, and cross-cut acanthus at the back edge. The torus descending in an ogee to the sight edge, as well as the enrichments, is characteristic of a French Baroque profile from the mid-17th century’. * … and probably not actually holly, but another bunch of crinkly-edged bay leaves, rotated to present a more varied and interesting appearance. ‘The Louis XV frame remains the apotheosis of styles by reason of its decorative elegance and the refinement of its execution. Appreciated by collectors, dealers, museums and artists (by Renoir, in particular), it became a major source for the eclecticism of the 19th century, and the model for thousands of copies. The fluidity and delicacy of the ornaments suit the classical cast which inherent in its symmetrical structure. The shell corners and centres project, but the S-scrolling lines of the contour unify the whole with the small shell demi-centres. The répareur has sharpened all the details by recutting them in the gesso layered over the ornaments carved into the wood. This frame is antique but not the original. It is at odds with the shadow of an oval frame which can be seen on the painting, and which must have formed part of an interior scheme of boiseries‘. 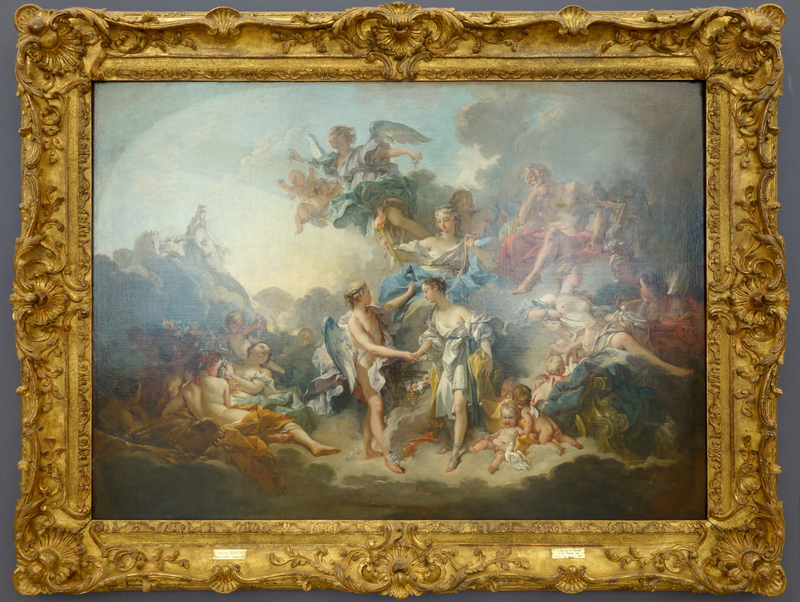 ‘In the context of NeoClassicism, the frame underwent a stylistic redefinition in the last decades of the 18th century, which set the seal of the antique upon it – in reaction to the flamboyance of the Rococo, which had been losing popularity since the mid-century. The new aesthetic was expressed in the frame by a new streamlined silhouette, and a cleanly-modelled profile decorated with rais-de-coeur. Contrasting the transient with the classical, the crest, on the other hand, broke into a decorative fantasy of floating ribbons and branches of bay leaves, characteristic of the Louis XVI style. These elements were applied, rather than being part of the architectural structure of the frame, but which oriented it upward; they might be varied by cartouches, tablets and garlands’. 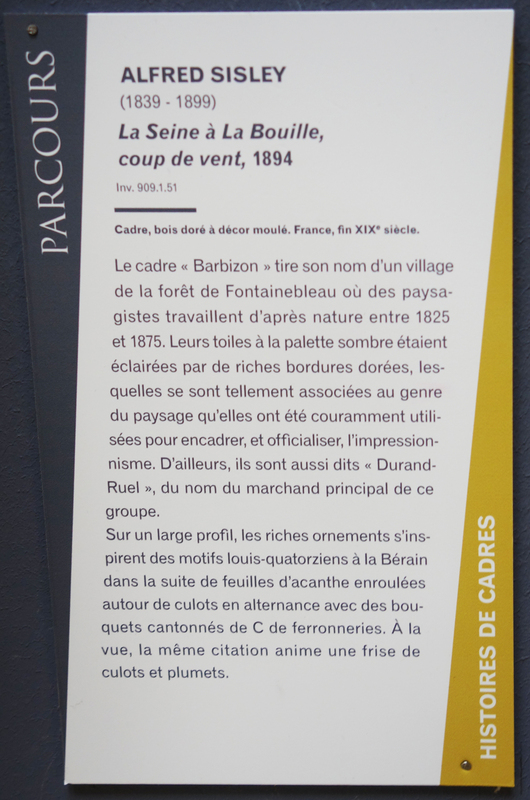 ‘The ‘Barbizon’ frame takes its name from a village in the forest of Fontainebleau where artists worked from nature between 1825 and 1875. 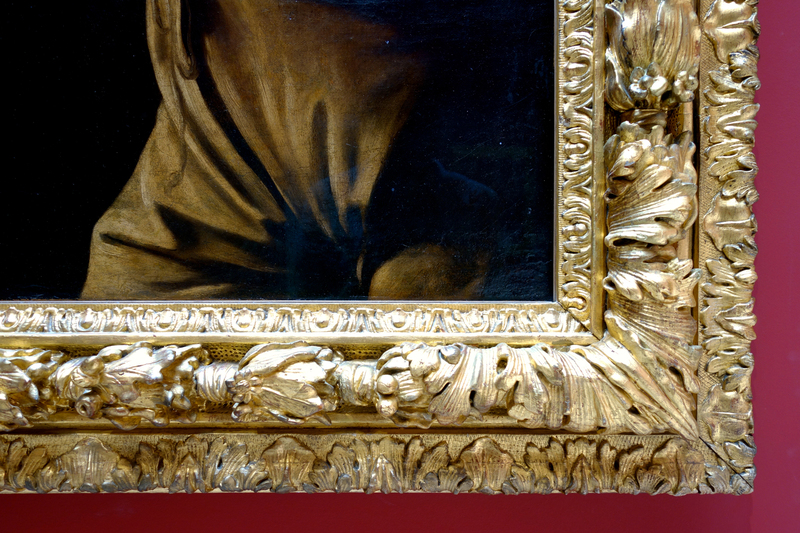 Their tonally dark canvases were illuminated by these opulent gilded frames, which became so closely associated with landscape that they have commonly been used to frame and tame Impressionist works. They are also known as ‘Durand-Ruel’ frames, after the principal Impressionist dealer*. The opulent decoration, applied to a bold convex profile, is inspired by Louis XIV Berainesque motifs: it is composed of undulating acanthus leaves between leaf-buds alternating with sprigs of flowers in opposed C-scrolls. At the sight edge there is a complementary band of strapwork, leaf-buds and fanned lambrequins’. * Note that Durand-Ruel actually had his own designs to frame the Impressionists’ paintings, and that, outside France, a ‘Durand-Ruel’ frame means something else entirely. ‘The frame has been out of favour since it was rejected by Modernism, especially for abstract paintings. Its rôle in the no-mans-land between illusion and reality was no longer necessary for those works which encompassed their own subjectivity and autonomy. 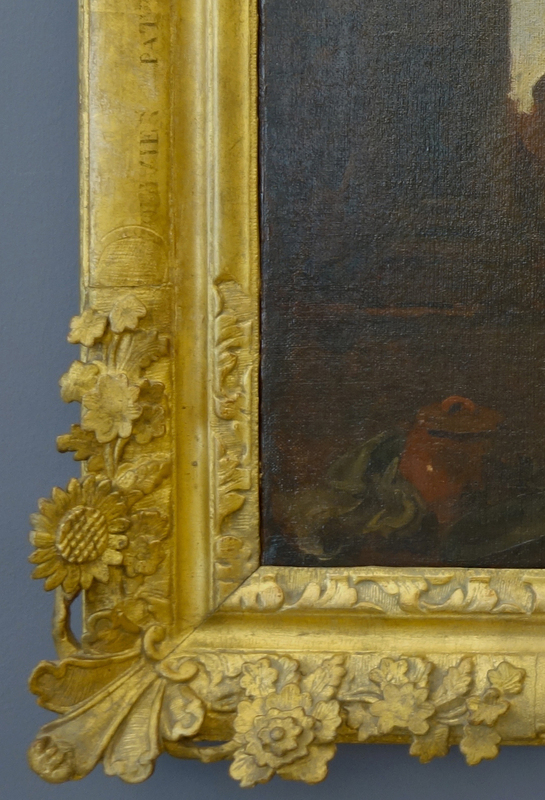 From the 1970s, this hostility was sometimes even responsible for removing the frames from Old Masters in museums, since there was a complete lack of interest in the historic dimension and aesthetic qualities of the frame. 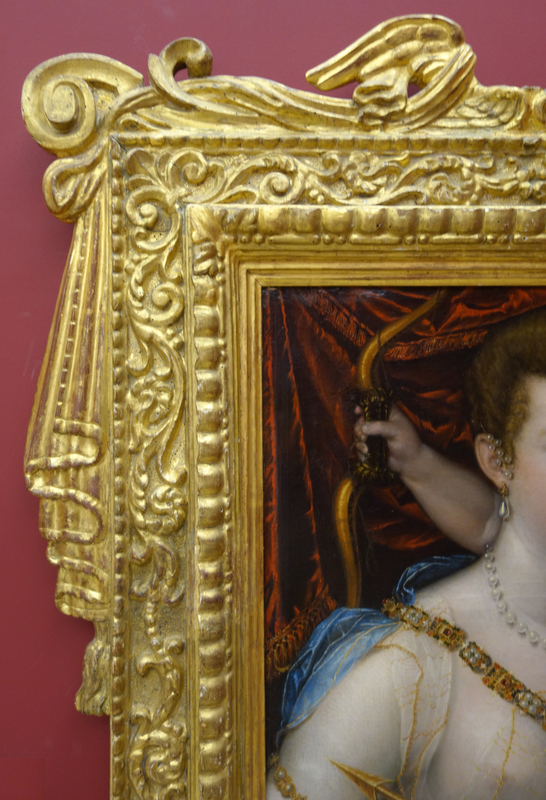 A purist hatred of decoration and opulence thus imposed a simple framing ribbon which hid the back edge of the canvas. 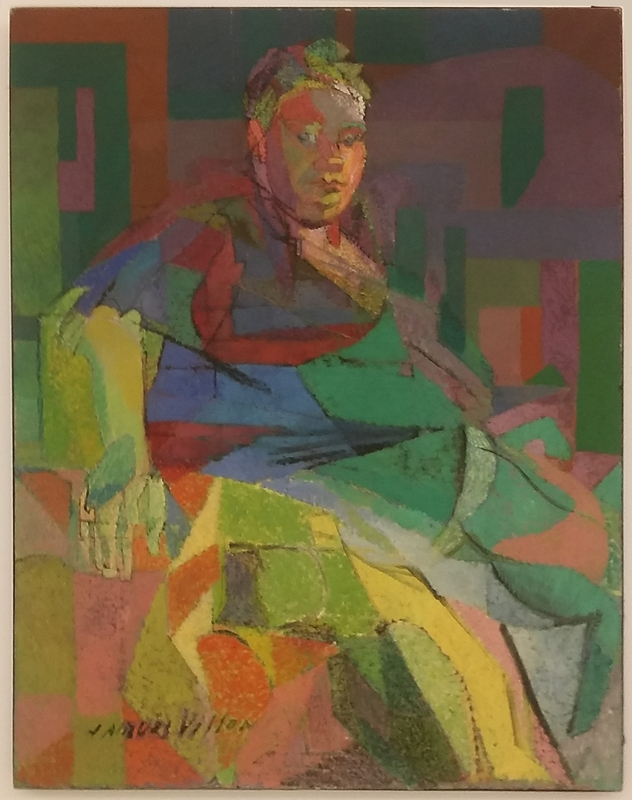 This principal worked with some modernist or contemporary paintings, but had no sense when applied to pictures which had been composed and created when the frame was an inseparable part of the overall work of art. 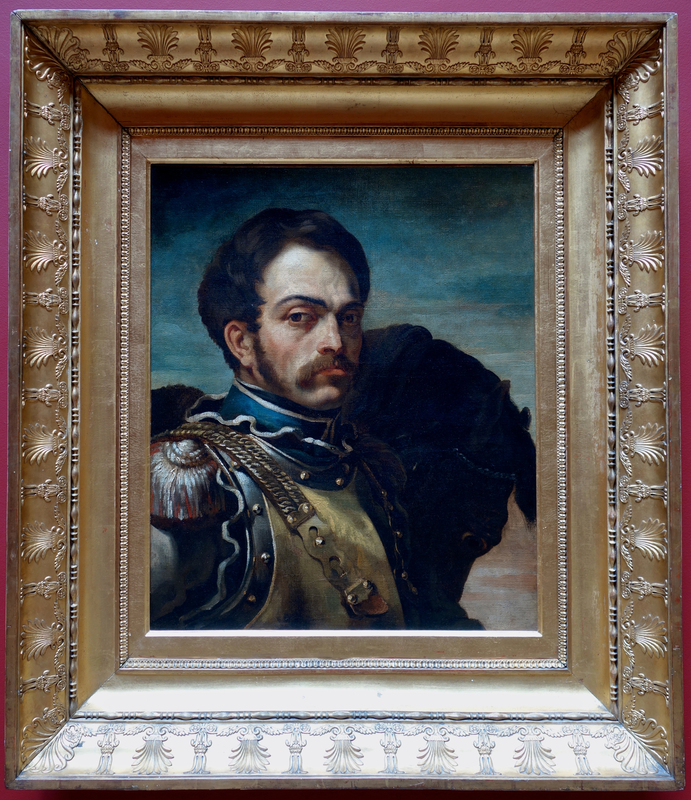 In reaction to this, from the end of the 20th century, the frame has been rehabilitated as a constituent element of the painting, giving it an historical and decorative context’. 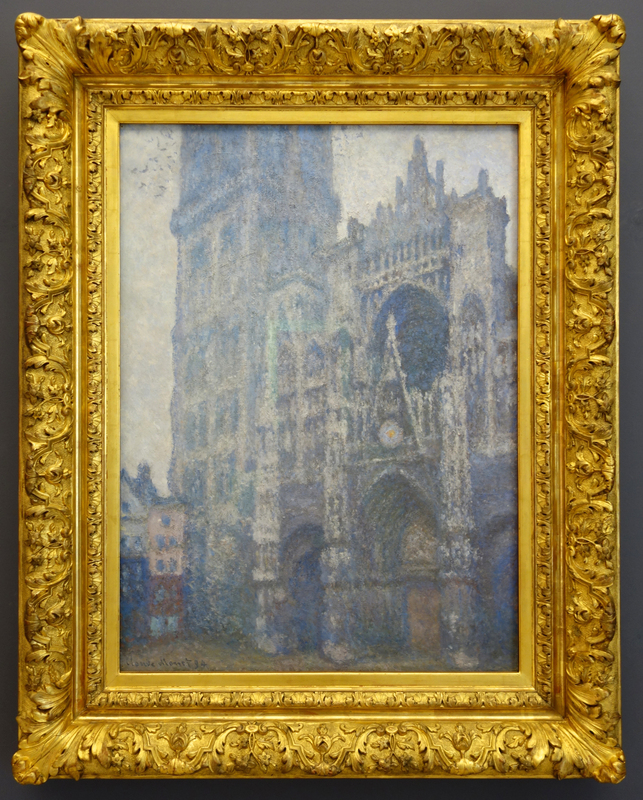 Lynn, I was interested to see the Gothicizing Monet cathedral frame from Rouen. 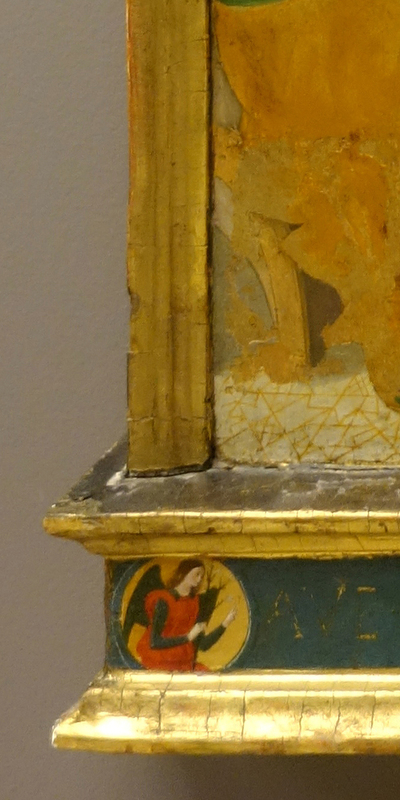 A follow up on the frames surrounding the paintings now at the National Gallery might be interesting — I was struck by the pseudo-Netherlandish example far left, with its Gothic lettering on the “sill.” It’s presumably the taste of the Davies sisters in Cardiff? I don’t know much about that, but I’d love to find out! Perhaps someone in London has thought about it?